I keep detailed notebooks of thoughts gathered from PD, readings, and meetings, ideas for future problems, lessons, and units, and reflections of small victories, detours, or interactions. I’ve used this system since before I’ve taught and it works well for me to process in the moment or look back on my thoughts. I am in the process of rewriting/rethinking my course standards for next year and I reviewed my pie-in-the-sky thinking and goal setting. And I stumbled upon my hopes and dreams of class discussions from July 10, 2009. Here’s what I came up with back in the day. Use sentence starters – How can I scaffold students to being good mathematical conversations? How can we talk about the process and not just the solution? Our approach was like ______’s work in that we both ______. Our approach builds on _______’s work in that we _______. Our approach was different from ______’s approach because ______. I know this works because ______. When I see ____, I infer ____. I think this was _____ when I saw/heard <evidence> because <explanation>. How were you thinking about it? 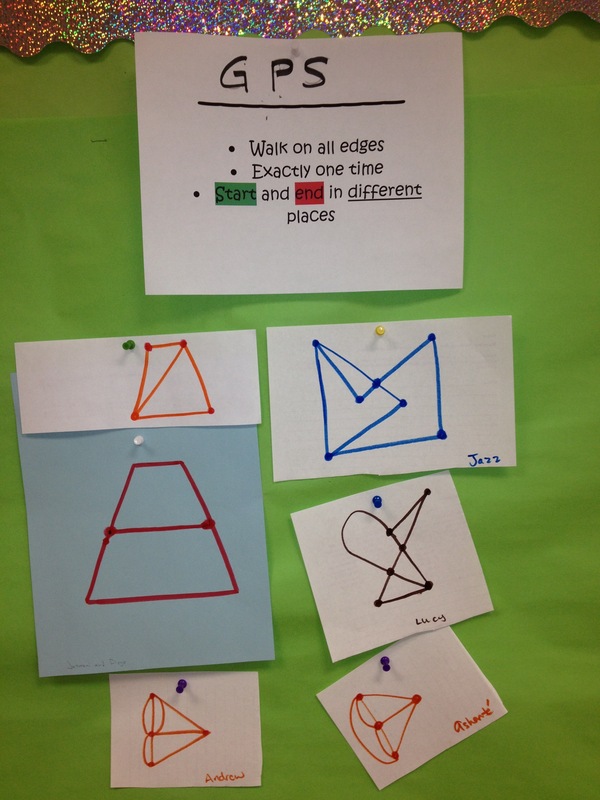 How does this representation show your thinking? Where are we able to generalize? What is different between these two problems? How do we capture that thinking onto paper? What does you agree/disagree with from this group? Think and digest this thought and rephrase their thinking. Are you able to come up and explain/walk through your thinking? What is the story of your work? How could you show it another way? How could you explain this in context? I think this flash back is a bit exciting. 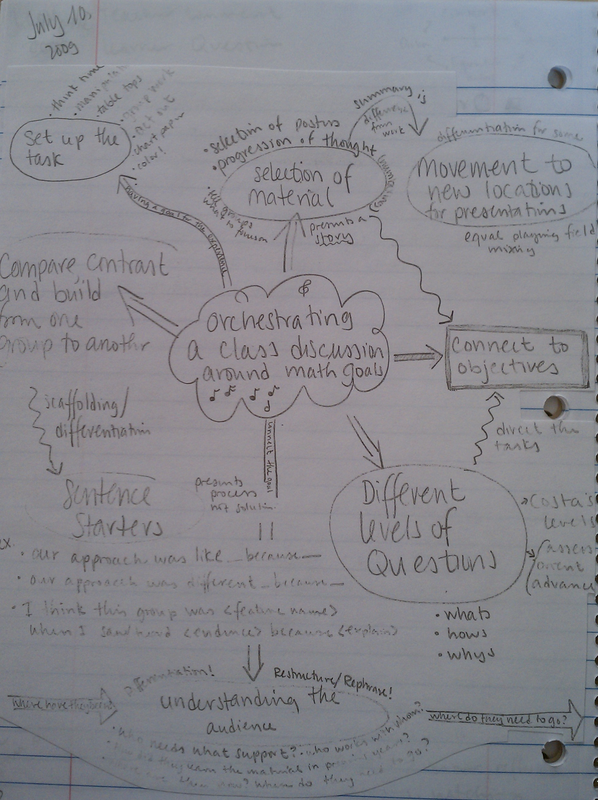 I know SL has been thinking about this a bit deeper than I have more recently, but my beginning thoughts from four years ago may persuade me to think a bit more about how to incorporate more sustainable discussion routines into classes. Other awesome things I should think about/remind myself about for math discussions? Perhaps I am a bit comfortable thinking about a system with year-long projects in my classroom next year…mostly because of what much of my “instruction” looks like in my classroom now. For the classes that I am the singleton teacher, much of the class time is driven on the idea of assessment as learning. (I mean, I also love assessment for learning, but much of my time is not spent there.) 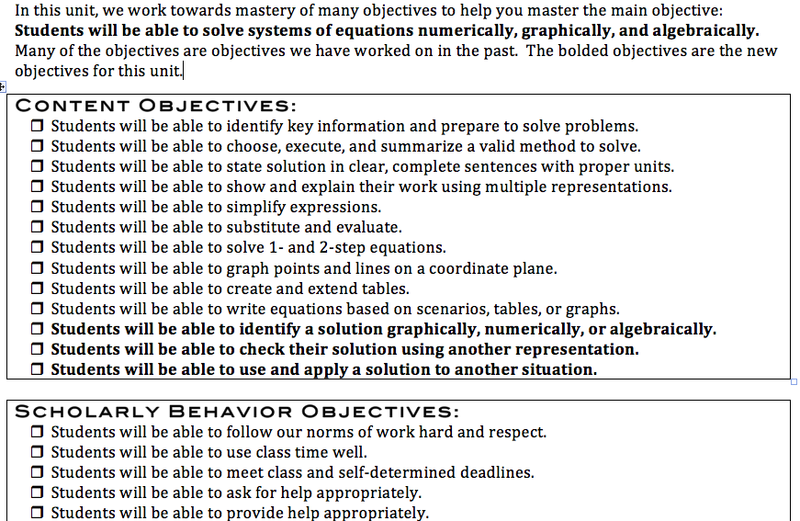 I give my little ones a page with the outline of the unit/week/chunk of time with the content and scholarly behavior objectives. With the assistance of adults/peer tutors, the students monitor their progress and think deeply about their progress towards mastery of my (the units?) predetermined objectives and of their personal goals. Then for the day to day situation, we follow a predictable schedule. The Do Now has a review of skills (for instance, creating tables from an equations). The students work on the DN until it is accurate and then retrieve their unit folder. They work on the next step of their unit work/project. As the students complete a chunk of work, they receive feedback (and not advise). The students make their desired revisions and then submit for assessment as they work on the next piece of the unit. Students make seek or offer help from/for their peers throughout the class period. The students in the minutes of class, write about their progress from the day and orally describe what their next steps will be. There is some sort of end date that everyone is working towards – but the end of the project looks different for various members of the class based on their needs and strengths. Then we have portfolio days where the students write about the unit skills and their progress in many skills. Recently, Langer’s residents separately came to visit one of my classes that uses this process. Both residents commented that the class seems to run itself and the students seem to know what to do. For an outside observer, this probably seems true. In order for this work to be successful, students and teachers need to be able to go with the flow and be able to set and meet personal deadlines based on a larger deadline and knowledge of oneself. I often wish the the students could stay on task for longer stretches of time, or recognize that that stamina is probably a good thing to develop. We have many conversations about what members of our community need and what we are able to provide to each other. We talk about how to provide feedback, use feedback, and reflect on trends in feedback. As I think about year-long projects, I think that this system that I have already used for a while will work for much of the time. I imagine that students will be able to have year-long folders (that are ongoing) and unit folders that are more immediate based on the current work. Because of the importance and focus of systems of equations in the Algebra 1 curriculum, I feel that a series of leveled systems of equations problems would work well for our thoughts of year-long projects. As students work on developing new skills, they return to problems and enhance their problem solving processes and solutions. Students will be able to employ multiple representations and problem-solving strategies to attack problems and make decisions. How do we do skills in a problem-solving oriented class? You’ve got a really awesome, quick answer for me, right? This one’s easy-peasy? I’ve been having many conversations about how to include skills/review in a class that is much more centered around problem-solving. It really helps when students can efficiently and effectively calculate with positive and negative numbers, solve equations, etc. How do we get that to happen? So, how to incorporate these skills without compromising values/the classroom? My first idea was to have 5 minute math sessions 3 days/week, emphasizing to students that this was about improving YOUR score and keeping everything fresh. Quick, clean, done. But … is 5 MM really the best for this task of review/skill retention? First of all, if a student is really stuck on how to do something effectively and efficiently, 5 MM is not going to help him/her get smarter. Second, even if I frame 5MM as a competition against yourself, we don’t care how you’re doing just that you’re getting better, etc., the practice still comes from a place of competition and drill. Plus, I went to a talk this weekend that included a statistic about how large a percent of people remember 5 MM as literally harmful. So, enter Number Stories, about which I learned in “What’s Math Got to Do with It?” (good book). With a number story, the teacher posts any problem that one could reasonably choose to do in one’s head on the board. Students then solve it in their head, giving a thumbs up when they have reached the answer. After some large percentage of students have thumbs up, students share different methods for doing the problem in their head. What are your thoughts on how best to incorporate skills and review into a task-oriented class? It is 6:30am on a Saturday. I’ve been up for at least an hour, worrying about how in the world I’m going to teach my students to do so many routines next year, many of which are new to me, many independently, all while trying to honor autonomy/purpose/mastery (love, Daniel Pink). First, I want to share my current idea of how the week could look (note: this hasn’t dealt with the fact the first period rotates and has students trickle in). From this, I have started a list of what routines I need students to be really good at. It’s rather intimidating. This scares me. I have only taught some of these as routines before. And not that successfully, all the time. But I want to do it. And I don’t think only doing some of it will work for me. Umm. Did I say only? Oy. I’ve been reading (slowly, ever since I realized I should take notes on my for-work reading, a task much harder on the T than just reading …), Drive: The Surprising Truth About What Motivates Us by Daniel Pink, recommended to me by several people. I think all the teachers should read it (in our copious spare time). So far, it’s focused mostly on intrinsic versus extrinsic motivators, and how external rewards often decrease internal motivation. That’s really important for teachers, no? So here’s my current wondering. I’m doing some sort of class meeting/circle next year. It’s happening. My current plan is to do this (at least) on Mondays (main purpose: build community, transition back to school check-ins, launch the main math task of the week) and Fridays (main purpose: close the week, celebrate community leadership, celebrate completed work). So I got the idea of celebrating work from ROLE Reversal, the same book that recommended Daniel Pink (along with my coworker). But, is celebrating completed work/final products, etc a reward? That would then decrease the intrinsic motivation of students to attempt more problems/revise more products? If so, I don’t want to celebrate completed work! But if not, I think it’d be a way to build community and get excited about math. Ok, I’m still really overly excited about Graph Theory (and teaching in a way more aligned to my philosophy!). While Kogut and I were at the AERA conference, my awesome student teachers led students through the Bridges of Konigsberg and the beginning of a snowplow route project, where students had to find a more efficient route through a neighborhood (in the future … smaller neighborhoods!). This week, we moved on to attempting to discover the rule for how to tell if a graph has a circuit or path and then a choose-your-adventure project. On Friday, for the Do Now, I asked students whether the graph below (drawn by a student on a HW) had an Eulerian circuit, path, or neither. The student had submitted it as a graph without a circuit (S/E) or path (GPS). Every single student thought the graph had neither a circuit or path. Except! One student, who barely talks to the large group, figured out it was a circuit. I whispered to him, asking him to go up to show the class. We started with a few students explaining why they thought it was neither. Then I called up this student, who showed the class his method of going in the circuit. All the students cheered and many gave him fist pumps as he went back to his seat. Sweetness. Today, we started the aforementioned project, inspired by Dan’s class set-up and this post about students teaching each other. My student teachers and I generated a list of “open questions” in our class about graph theory — some have come up, some are just about theory we haven’t studied yet. The students had to choose 3 questions they would be willing to work on, and then they formed groups n < 5. They spent the period answering the questions and all (almost all?) the students were really working on the math, discussing with each other, etc. I barely did any work or talking. Students asked each other questions, checked their work, and arrived at accurate responses. One group went to the board with our collection of graphs to determine whether it matters where you start on a graph with a path. – Circuit’s vertices have even degrees. 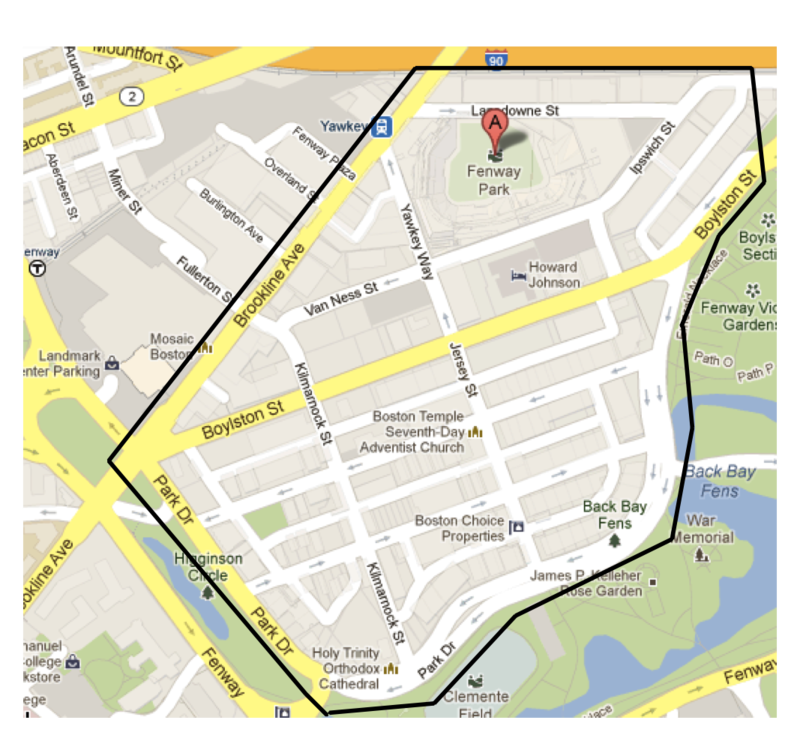 – Path’s vertices have some odd degrees. – Graphs with neither a path/circuit have MORE vertices with odd degrees. Despite the fact that they were so.close. to the final theorem (and the adults in the room were making awesome faces over students’ heads as they danced around the answer), we did NOT give away the answer. I’m hoping it might come up during the student-led lessons. 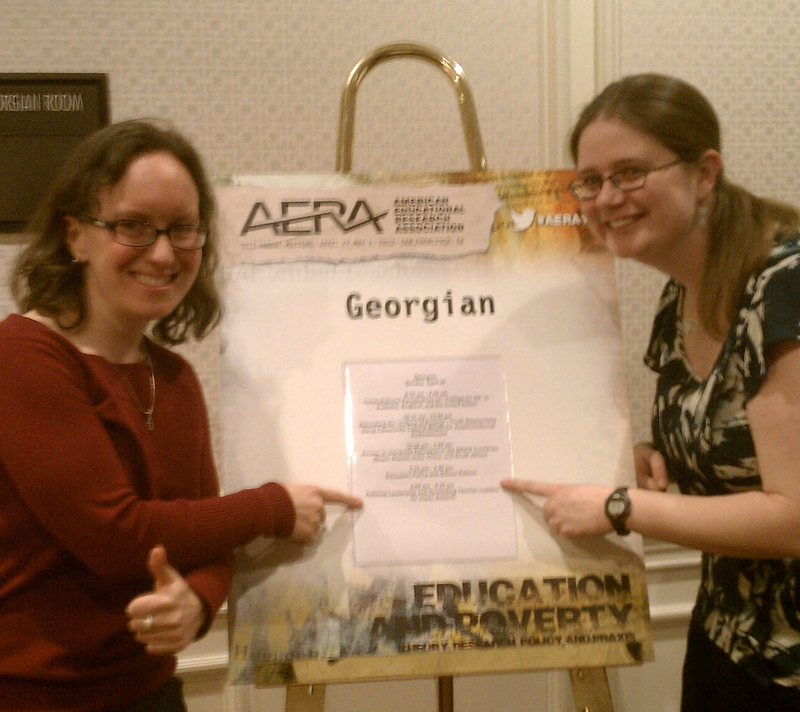 SL and I went to San Francisco to present our work at the American Education Research Association (AERA) conference. AERA, a national research society, strives to advance knowledge about education, to encourage scholarly inquiry related to education, and to promote the use of research to improve education and serve the public good. The conference had a very large amount of educational policy writers, researchers, and professors. SL and I were in the EXTREME minority of practicing teachers. While I understand we did not represent the intended audience of the conference, it is a bit … sad … to have such a large education conference without teachers. I’ve never been to a conference that didn’t give me positive energy and push me to think more about my place in the field. Look! We are listed! It’s official! Our panel presentation was well received. Our discussant, Ann Lieberman, recommended additional readings and pushed us to think about the social (and not just individual) aspects of teacher leadership. Attendees asked us questions along the lines of how to do we differentiate leading adults versus teenagers, which amused me. Days that I treat my students more like functioning adults rather than adults-in-training have better results. PDs and meetings that I plan for like I am planning a sub-sep class seem to run better than those I plan for as if they are just meetings. So perhaps I need to think more about what leading adults versus kiddos actually looks like. All of this work started with a group of East Coast teacher leaders who I am always in awe of whenever I check in with them. And, of course, the conference made me think about many things about me, my profession, and my classroom. 1. It was a bit weird to attend a conference about education without many teachers (as I stated above). This thought leads me to believe I need to involve students in more school-wide decisions. I need to think about what sorts of scaffolding I need to provide to students so they understand the norms and traditions of typical meetings and so they feel comfortable participating in decision-making situations. I am continuing to think on this. 2. Perhaps I should read more scholarly works about my field. I mean, I looooove reading blogs, NCTM and ASCD articles, and PD books, but I feel this conference reminded me there are people who are “representing” my voice and I should probably stay on top of what they are saying. 3. I need to continue to process my whiteness professionally. Because the organization’s focus this year centered around poverty, there were many panels about race and class. I enjoyed participating in conversations about preparing pre-service teachers for urban teaching, helping students think about the many aspects of their identity, and structuring anti-oppression teaching. In one particular panel, the chair stated it was intended NOT to follow typical panel etiquette (silence while the presenter speaks, questions during the set aside time, and praise when the session concluded), instead she wanted to set up a Baptist Church environment (introductions which highlighted accomplishments and various ways of verbally and visually announcing one’s agreement to whatever was currently being stated). The panel was a much more celebratory feel of the work being presented and reminded me of my classes in BPS. I need to continue to draw on all of my educational experiences and backgrounds to build a culturally responsive classroom. 4. I need to continue my development of scaffolding that help students be successful in a variety of settings. I want to not only think about what sorts of things will help students think about the math but also how to communicate their thinking to others. Social and scholarly behaviors objectives need to become crisper and more transparent to the students. Hooray for conferences! I am eager to continue to process the experience and think about what future work may stem from here.